What Happened to Hard Rock Park? Neil Young once sang, "Rock and roll will never die." 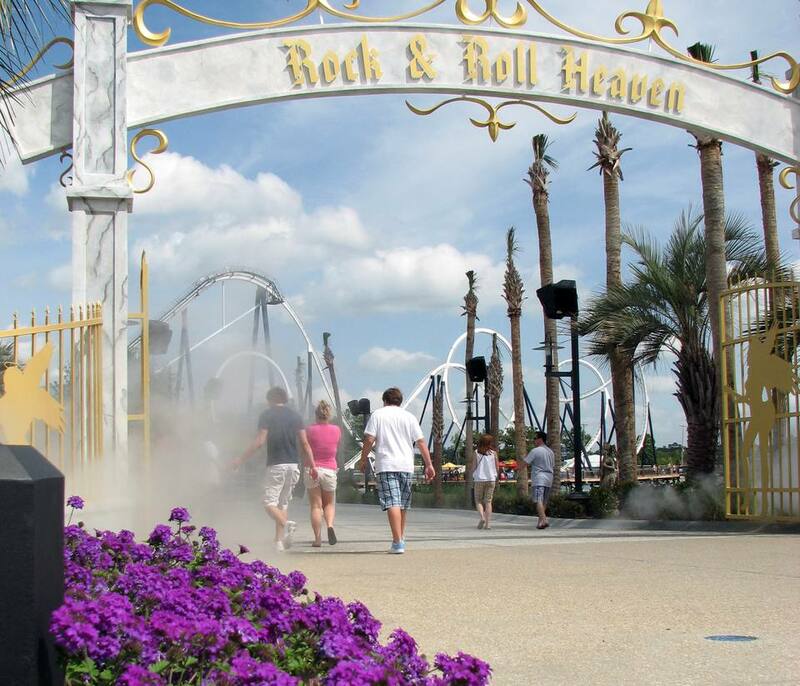 That may be true, but Hard Rock Park, a wonderful theme park devoted to the musical genre, died a swift and premature death. After opening in 2008, the Myrtle Beach, South Carolina park filed for bankruptcy before it reached the end of its first season. It reopened under new owners and management in 2009 as Freestyle Music Park. Unfortunately, that park closed at the end of the 2009 season and did not reopen. Many of the rides were sold to other parks, and the property has been razed. There are a number of reasons that may have led to the park's demise. It's likely that it was a combination of factors. For starters, it suffered from spectacularly bad timing; the park opened in the second half of 2008, just as the Great Recession was unfolding and the economy was cratering. Hard Rock Park also suffered from a woefully underfunded marketing budget. Hardly anybody visited the park, because hardly anybody knew about it, especially outside of its local market. The hope, apparently, was that the throngs of visitors who came to Myrtle Beach and clogged the Grand Strand beaches would find their way to the park once they arrived. The beaches were plenty crowded in 2008; the park was not. Its operators also made some boneheaded moves, including charging a premium ticket price with no discounts for children or seniors and never offering any discounts or promotions—practices and policies in which virtually every other park engages. There are a number of other factors that may have sealed the fate of Hard Rock Park, but there's no denying that it was a great place. Let's reminisce about what made it so great. Music was everywhere: playing in the background throughout each land, providing the inspiration for every ride, and being performed live on multiple stages. Music even followed guests into the park's bathrooms. The level of detail was often astonishing. For example, the original version of a song, say "Purple Haze," that played along the walkways in the Rock & Roll Heaven area seamlessly morphed into a note-for-note calypso version of the tune as guests approach the Reggae River Falls attraction. Those kinds of moments, along with the park's considerable whimsy (i.e. an Elvis-looking cow statue made small talk with onlookers before spraying them with his udders) and innocuous irreverence (the neon in the Great Meals Diner sign was conveniently broken to read "Eat Me") set an infectiously upbeat tone that couldn't help but generate smiles. Rock music, which ironically once served as a generation-defining clarion call, but now bridges generations, served as an ideal point of reference to connect the park with its broad range of guests. Having said that, was Hard Rock Park for everyone? Don't let the "Hard Rock" tag throw you. Like the Hard Rock Cafes with which it was affiliated (although, oddly, there was no Hard Rock Cafe on site), the park featured many musical genres, with an emphasis on age-spanning classic rock. Unlike the cafes, however, the music was not ear-splitting, so families and older guests could maintain their sanity (and their hearing). With the shows, live music, and cool vibe, coaster-averse visitors could find enough to do. It would have been nice if the park had more attractions like the Moody Blues ride, Nights in White Satin- The Trip. Parents may have balked at paying full price for young children; the activities geared for kids under 36 inches probably didn't justify the cost. Hard Rock Park didn't have the squeaky-clean persona, highly immersive environments, or blockbuster E-ticket attractions of a Disney park (although Nights in White Satin was near-Disney quality and quite trippy). Nor did it have a Six Flags-worthy arsenal of thrill machines (although the 150-foot tall, 65-mph Led Zeppelin coaster more than held its own among white knuckle rides). But Hard Rock Park did have a compelling theme that it cleverly exploited to create an engaging, fun experience. I know: It's only rock & roll. But nearly everyone likes it. And nearly everyone who visited (which granted, wasn't a whole lotta people) got a kick out of Hard Rock Park. All Access Entry Plaza - What would a Hard Rock Park be without retail shops? This was the place to make impulse purchases on the way in and out of the park. Cool Country - It's only natural that a park in the South, even one that's focused on rock and roll, would have tipped its cowboy hat to country-rock music. It featured Eagles Life in the Fast Lane, a mine train-style family coaster. Rock & Roll Heaven - This area was dedicated to Jimi Hendrix, John Lennon, and other rock legends who were no longer cranking it up to 11. Curiously, it included a reggae-themed interactive water play structure and a Malibu Beach Party diving and stunt show. British Invasion - The Beatles, Stones, The Who, and more modern-day UK artists got their due here. This was the most lavishly themed area of the park. It featured Led Zeppelin- The Ride, a world-class thrill ride with a wild Led Zeppelin overlay. This is where the Nights in White Satin Ride was located as well. There was also a unique roller coaster that used a Ferris wheel-like launch system. Born in the USA celebrated US-bred rockers (who were presumably not dead, didn't record in the 70s, and had nothing to do with country music). Among its attractions was Slippery When Wet, an inverted coaster with onboard water cannons. Museum Mystery: What Happened to Michael Rockefeller?